Has your Dad been a hero in your life? Every father is different but I think most have a unique quality that makes them a hero to their children. All of the little things add up over the years. I know for me, my Dad has always been a calming influence in my family. Some people may think TOO calm 😉 He was the fun one most of the time, but also kept things silently in line. A voice of reason. Plus, he put up with FOUR girls! Definitely requires some patience right? What’s the best advice your Dad ever gave you? How has he been a hero in your life? For me, that solid advice of taking your time before making a big decision. Don’t rush into things. Weigh the pros and cons. You can enter to win a year membership to BJs by sharing your stories here. I think pampering has normally been a “Mother’s Day thing” but Dads need pampering too! 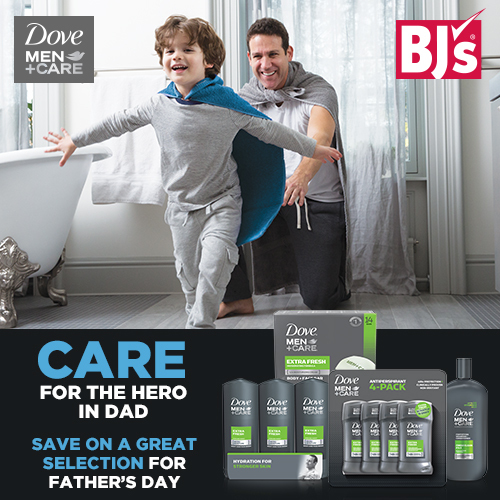 I know my hubby certainly likes the better quality pampering items and Dove+Men Care has just the line for that extra pampering that Dads need. Head over and check out the collection now!